IN THE LAST two months, the government has given a very convincing display of ineptitude, weakness and frivolity as it turned its dispute with the teachers into running joke. There is only one person to blame for this epic embarrassment – President Anastasiades, who initially posed as the resolute and uncompromising leader. He then proceeded to systematically water down the government stance and ended up offering the teachers perks they had not even asked for, including more money, in the desperate hope they would feel a little pity for him and call off the strike threat. Anastasiades’ image as a strong and decisive leader has been shattered with the teaching unions showing him up as a weak and unprincipled president that was not prepared to stand up for what he believed was right. He stood firm for almost a month and a half, telling close associates that he would not back down, but as soon as he realised the unions would not budge either and were set on striking, he began his retreat. The president, rather foolishly, decided to become personally involved in negotiations under the illusion he would throw a little money to the unions, secure a face-saving compromise and claim credit for his achievement. What poor judgment this proved. On August 23, he called the union bosses to the presidential palace drafted a compromise deal with them and the teachers then threw it back in his face, telling him they cannot be bought. A few days later, some 10,000 teachers demonstrated in Nicosia, the message being they wanted Anastasiades’ unconditional surrender. A couple of days after the protest, on August 30 another compromise proposal, with a few more concessions was announced by the government, while last Tuesday a new, modified offer, with a few more concessions, was approved by the council of ministers and presented as a decision. At the same time, teachers’ ballots authorised the executives of their unions to call strikes. 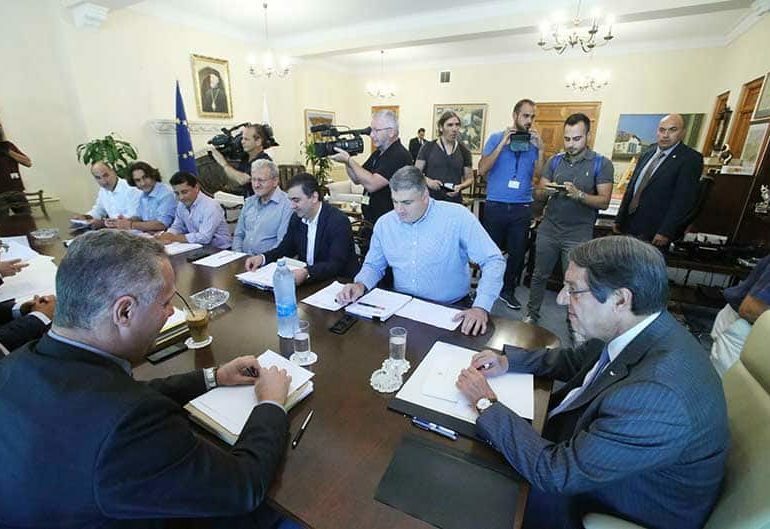 At Tuesday’s council of ministers meeting in yet another embarrassing retreat, Anastasiades went halfway to meeting the teaching unions’ demand for the removal of education minister Costas Hambiaouris. The dialogue with the teachers would be carried out by a ministerial committee, chaired by Hambiaouris, who was joined by the ministers of labour and agriculture, the latter having been the education minister in Anastasiades’ first term. Even on this the president made a concession to the unions, although Hambiaouris did nothing more than try to implement the government’s policy for the so-called “rationalisation” of public education. Concessions were also made during the meetings between the union bosses and the ministerial committee on Wednesday and Thursday when the two sides drafted a new proposal together. The Poed general secretary, who had reported Hambiaouris to the police on Monday for allegedly depriving union officials of their right to perform their union duties, said there were some “additional positive points” – in other words more concessions – in the latest proposal. The deal Anastasiades has so ineptly tried to secure through the tactic of increased discounts has still not been sealed, with the unions’ leaderships now divided. Secondary teachers union Oelmek wants more concessions, its vice president underlining its militant attitude commenting after the last meeting Facebook account: “… they (the government) will kneel, what can they do? Whether they like it or not.” The government kneeled two weeks ago and has remained on its knees since then, embarrassed and discredited, begging the unions to show it a little mercy by agreeing to end the dispute. He may secure this objective by Monday, but no amount of political spin by the government would conceal the fact that his was a humiliating, self-inflicted defeat for which Anastasiades is exclusively responsible. On July 4 the government took a decision to “rationalise” public education and save €7 million; close to half of this saving will now be paid to the teachers, who will also receive promotion credits for agreeing to surrender much fewer of the non-teaching periods than the original decision envisaged. It did not end there, Anastasiades generously offering a new privilege – the six to 12 per cent reduction in the retirement bonus given to public servants that take early retirement was scrapped for teachers. The proposal was nothing more than a bribe and was seized by the unions; it will have a costly knock-on effects as all public employees will demand it. The rationalisation of public education that the government trumpeted two months ago could only be seen as a bad joke. And it is entirely thanks to a weak-willed and unprincipled president who chose to surrender to the unions rather than face the consequences of standing up to them and refusing to be bullied into submission. More public sector unions will prey on his well-advertised weakness in the months ahead, but Anastasiades does not seem to care, as taxpayer will pick up the bill.